If you follow me on Instagram, you saw lots of scenes from my family’s summer vacation. We visited a LOT of places on the East Coast! We started in Virginia, then went to Washington D.C, Philadelphia, Upstate New York, Boston, and New York City (with some stops in between!) It was a two week adventure and we had such a grand time. Since we’ve been home, and all of our friends know how many neat places we’ve been, people are constantly asking my kids what their favorite part of our trip was. Some of their favorites tend to change depending on the day but one has been consistent since the moment we got home. Every one of them always lists Fort Ticonderoga as one of their favorite stops. I actually didn’t know much about Fort Ticonderoga before we left. My husband planned this trip and it was on the itinerary and I just rolled with it. 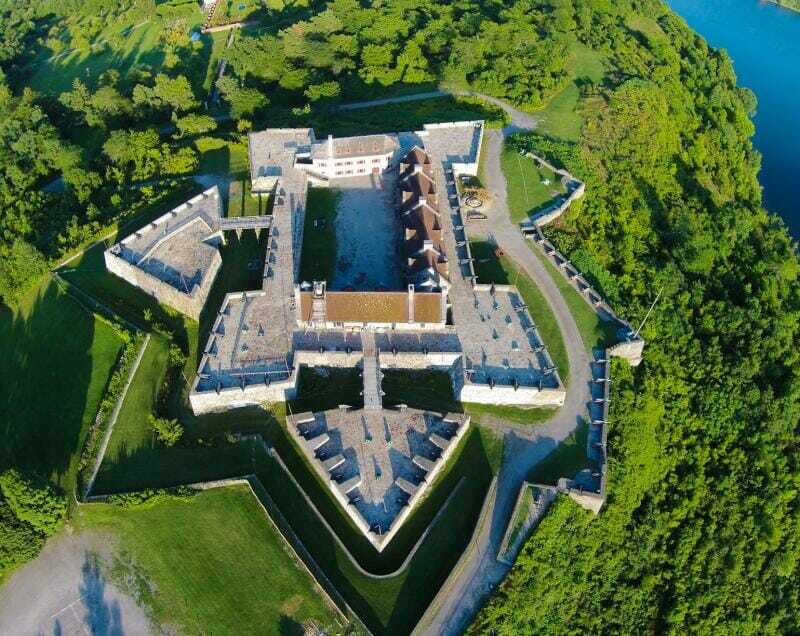 I’ve been to some historic military forts before, but I’ve never seen anything like this huge, majestic Fort, with exquisite landscape covering nearly 2000 acres in the pristine Adirondacks above Lake Champlain. Look at this view! I didn’t realize it was such a destination location. You could easily spend an entire day (or more!) there, and with the themes and collections changing regularly, you can go back again and again and experience different things each time. We got to watch a live canon demonstration, walk down on the docks where you can take a boat ride, experience different tradesmen and women who actually learn the real skills they are sharing, like shoe-making, sewing, etc., and see tons and tons of early modern weapons and artillery (my boys’ favorite). When we arrived, I immediately gasped in awe at the most gorgeous armory I have ever laid eyes on (who knew cannons could be “gorgeous”?!) Look at those! We were fortunate enough to get an amazing tour of the property from President and CEO Beth Hill because of our association with one of our favorite brand partners, American Heritage Chocolate ®. 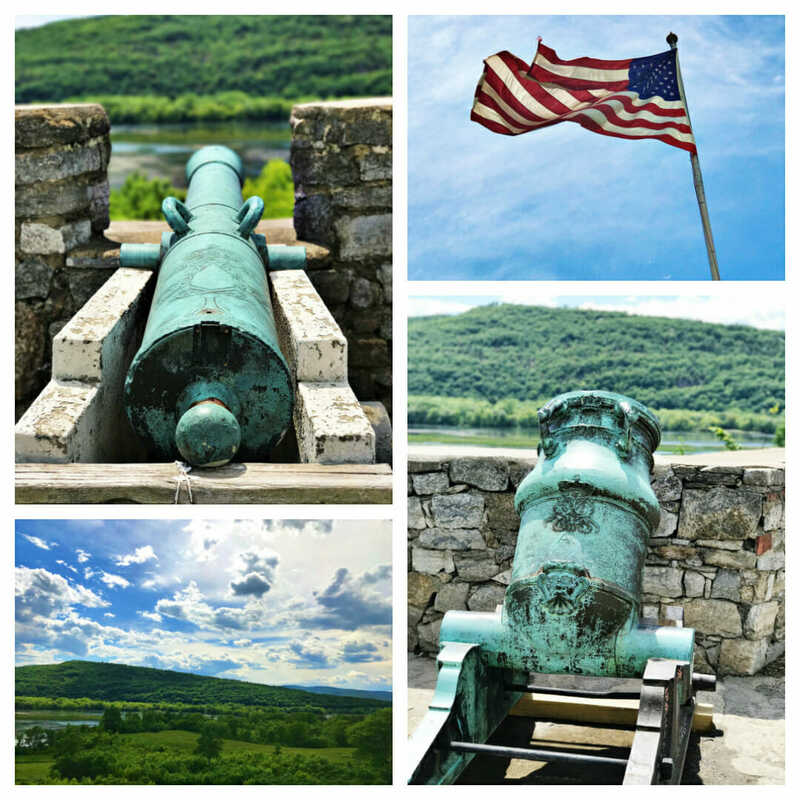 They partner with historical preservation sites across the country, including Fort Ticonderoga! The first place Beth took us were to the King’s Gardens. Anyone who knows me should not be surprised that this was my favorite place. 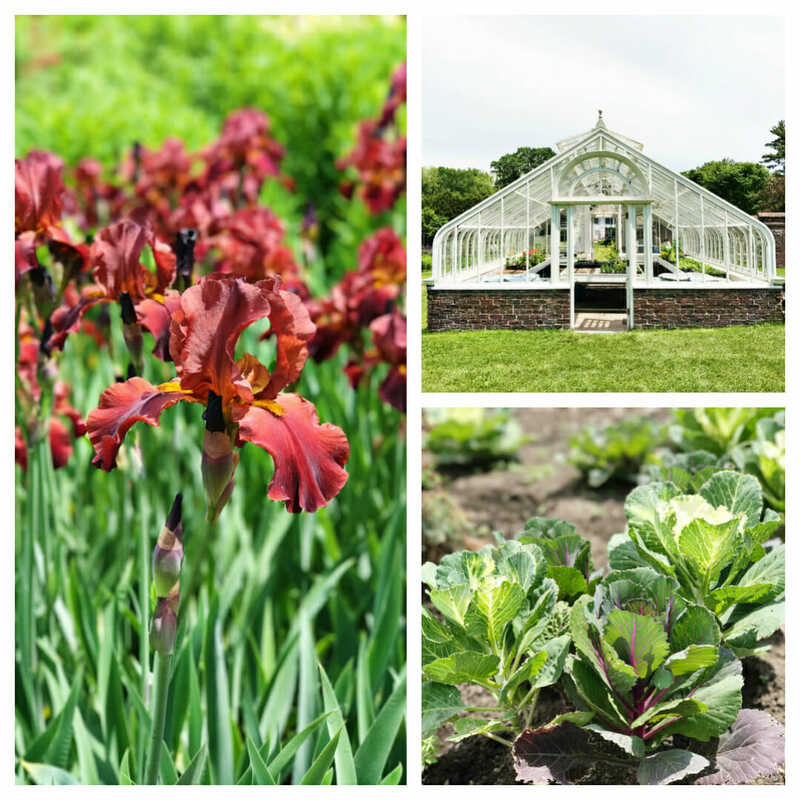 This space is one of the oldest cultivated gardens in America and was designed by Marian Coffin, the country’s first female landscape architect. (I almost cried when I learned that. As many of you know, that was my previous career before venturing into food and Marian Coffin is super-hero material in my world.) 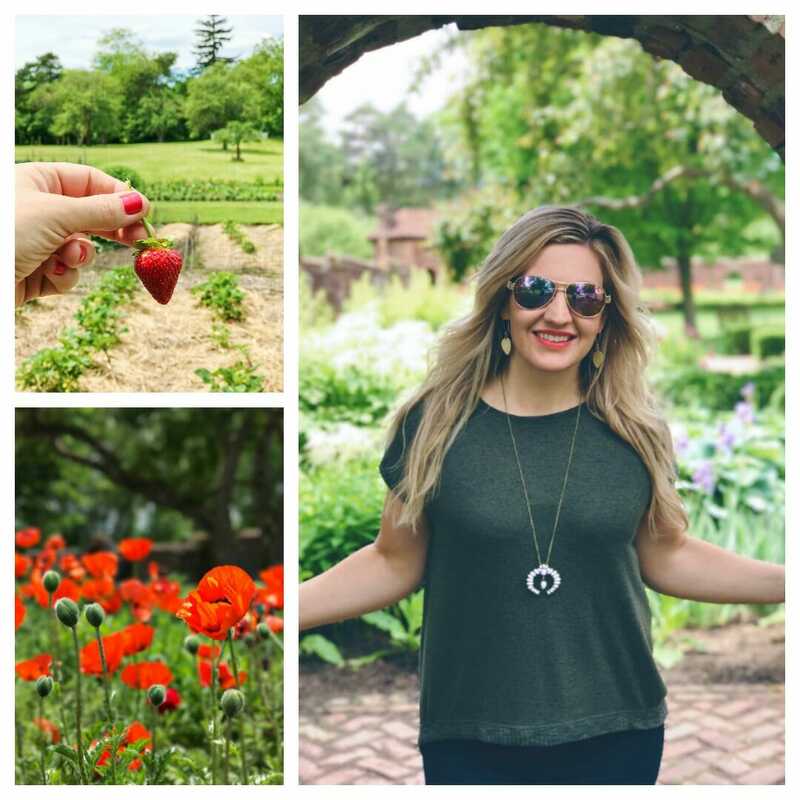 We got to try some fresh strawberries and take about 4720 photos of the spectacular flower gardens. They have a historical horticulture program at the King’s Gardens and grow all kinds of heritage plants and fresh garden produce. Our fantastic French soldier, Stuart (pictured in red, AKA Stuart Lilie – Vice President of Public History and Operations) was a knowledgeable guide and even picked a few things from the garden to cook up in the camp kitchen. To everyone’s surprise, my kids have actually never even tasted a radish, so they got to experience that fresh from the garden. As it turns out, they share their mother’s disdain for radishes, but hey- they can now say they’ve tried them! I found this camp kitchen to be so fascinating. You can see in the bottom photo below, how there is a round mound of earth with holes on the top. Fires are built underneath the open holes and then cast iron pots are placed above them to cook. I thought it was brilliant! Stuart cooked up his garden bounty, and we all got to try a fresh pot of American Heritage Drinking Chocolate, thick and dark, just like they would have drank it back then. I loved being inspired by this historical treasure and my mind was turning, thinking of different dishes I could make inspired by everything we experienced. I knew immediately that I wanted to cook something in cast iron. There is something so rustic and historic-feeling about cooking on those heavy, seasoned pans. 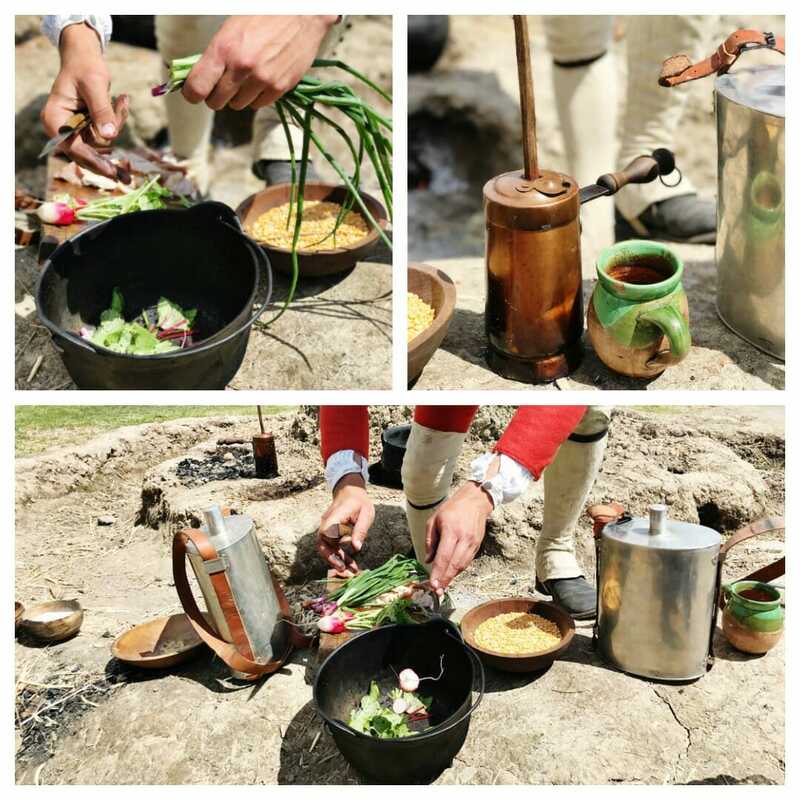 I wasn’t about to dig up my backyard to create an authentic camp kitchen like at Fort Ticonderoga (surprise, surprise!) but I think you get the same feel from cooking with cast iron in your oven, or on the grill! 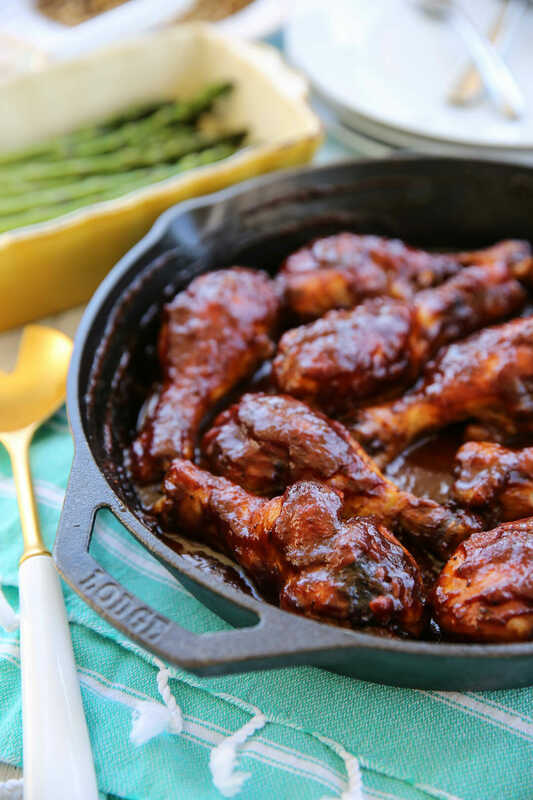 I went straight for some messy, saucy, down-home drumsticks, because nothing feels as rustic and historic as eating meat straight from the bone with your bare hands! 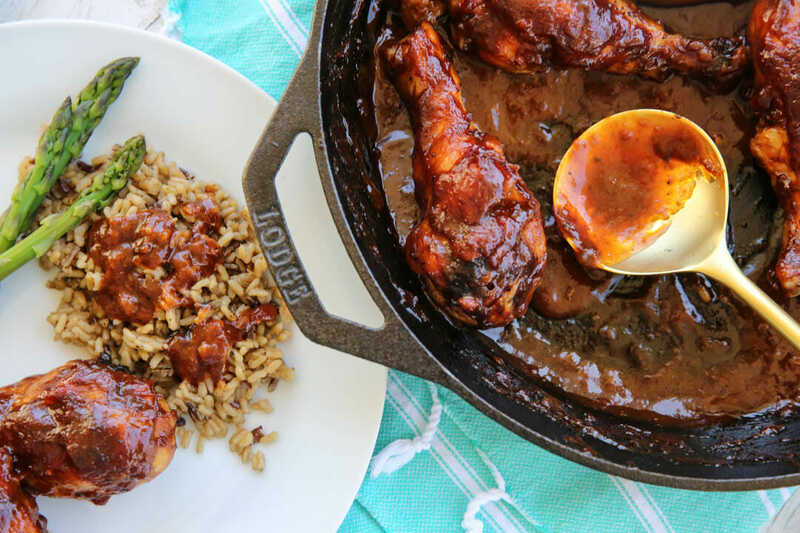 My kids LOVE drumsticks and this recipe turned out even better than I imagined it would. You’ll never guess what the secret ingredient in my sauce is. Well okay, maybe you will. It starts with Choco and ends with late. That’s right people, we’re putting chocolate in this sauce. Stick with me and learn. These are some seriously good chicken drumsticks. You’ll start by covering your chicken with a spice rub and then searing them in a hot pan. If you don’t have cast iron, a 12″ oven-proof skillet will work. To prep them, I trim off as much excess skin as I can without them falling apart! If you take off too much, the meat has a tendency to just fall off when you pick them up. If you’re imagining them as ice cream cones (I know, sounds weird, but stay with me here) I pull the skin back to expose the scoop of ice cream, but leave it on the cone. Does that weirdly make sense?? 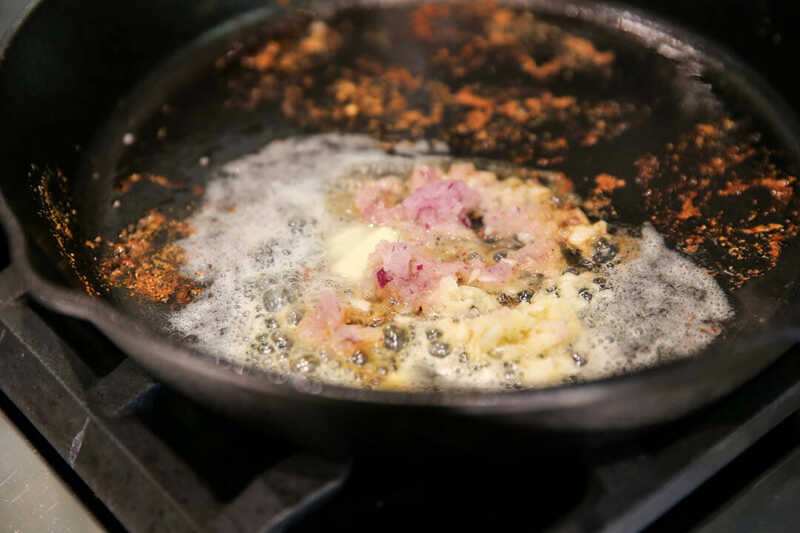 Once they are removed, you’ll have gorgeous browned bits of chicken and seasoning and you’ll toss some butter, onions, and garlic in there to loosen it all up and add flavor to the sauce you’ll build. 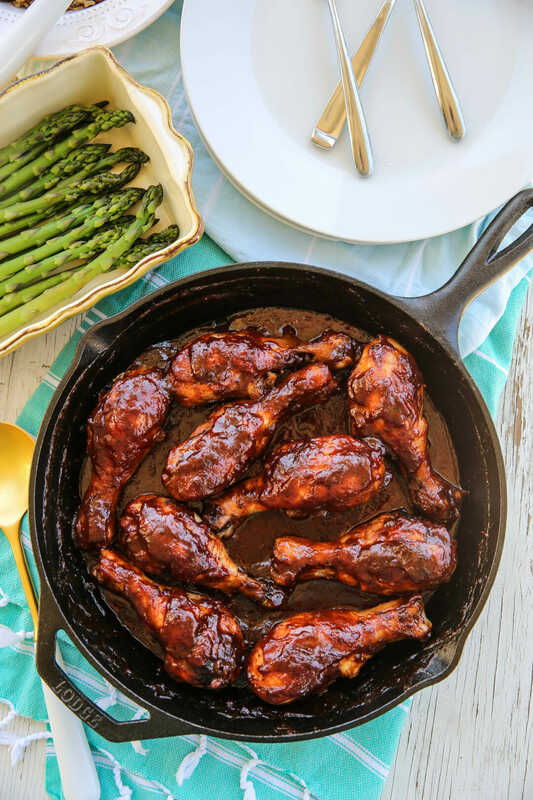 Simple ingredients like ketchup, brown sugar, Worcestershire, mustard, and a few other things go into the pan sauce and then you’ll add just the right amount of chocolate. I love American Heritage Chocolate ® here because you get a really dark chocolate with added flavors of things like chili powder, orange peel, and nutmeg. 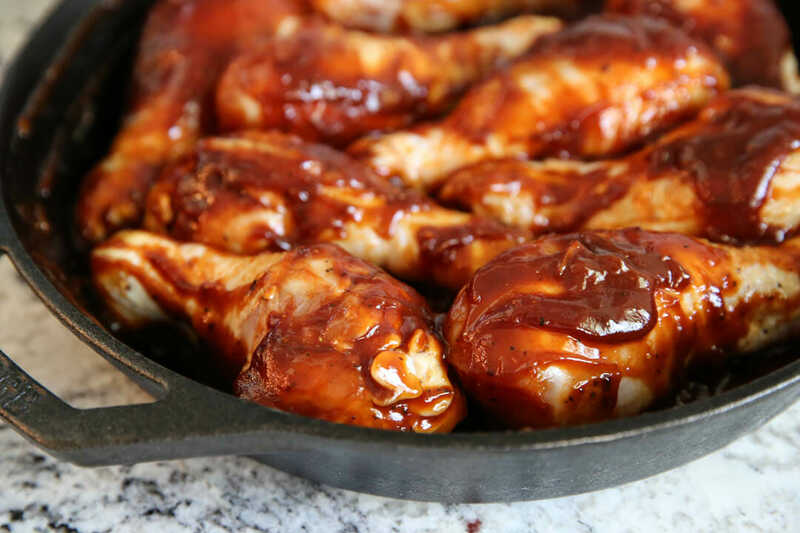 It all blends perfectly with the flavors of the sauce, like a sophisticated BBQ. I’m using their finely grated chocolate. You could also grate your own. You’ll add the chicken back into the sauce and then place the whole pan in the oven to finish cooking. 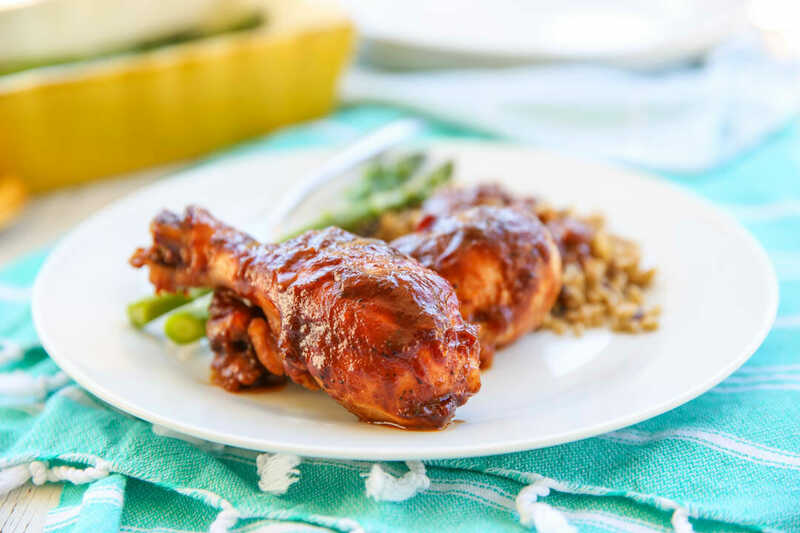 The finished product are juicy, tender drumsticks with the most amazing sweet and tangy sauce. It has so many layers of flavor, and while you would never know there was actually chocolate in there, it adds a richness and depth like no other ingredient can! 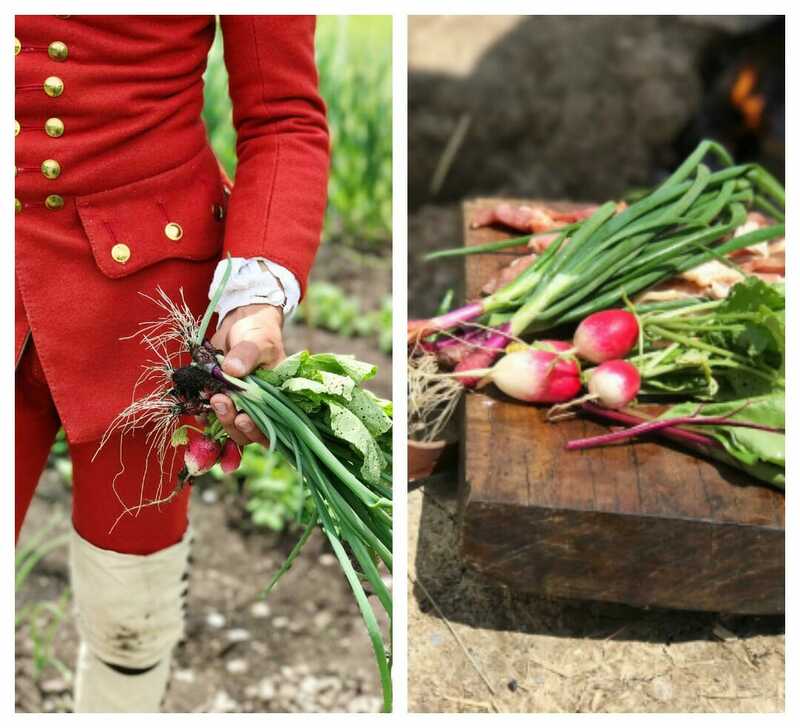 My favorite way to serve these is with a simple side, like freshly picked asparagus they grow in the King’s Gardens at Fort Ticonderoga, and rice. The sauce is so great spooned over the rice and when you take a bite of everything together, it’s perfection. This is something I’m going to make again and again! Pat chicken dry and lay on a piece of foil or a cutting board. Pull the skin back at least half-way and trim off with a pair of clean kitchen shears or scissors. Combine rub spices and sprinkle over all sides of chicken, lightly patting in with clean hands. 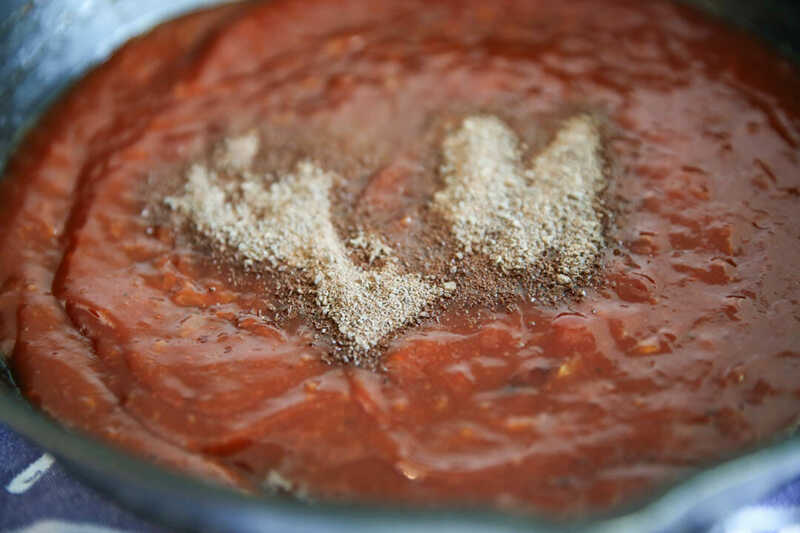 In a separate bowl, combine ketchup, brown sugar, honey, mustard, and Worcestershire sauce. Set aside. Place a 12 inch cast iron skillet over medium heat. Add olive oil and tilt to cover bottom of pan. 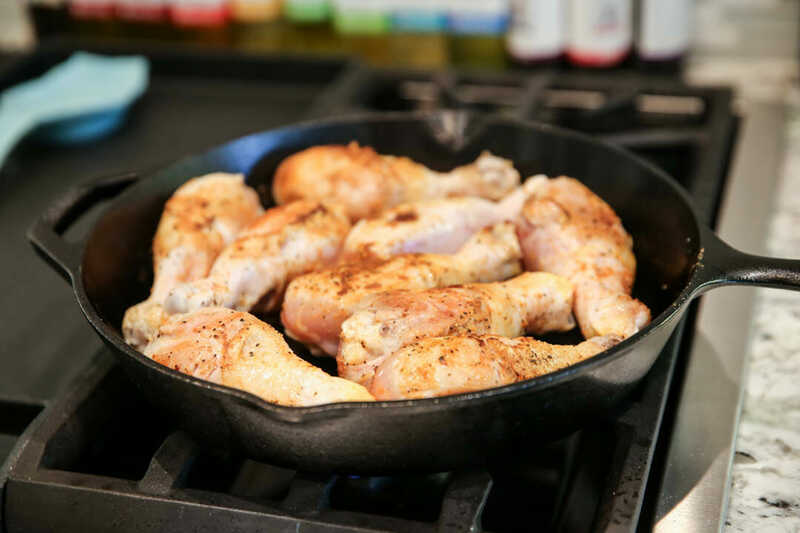 Arrange chicken pieces in pan and cook for 2-3 minutes on each side to sear. Remove chicken pieces and place back on your foil or cutting board. Reduce heat to medium-low and add butter, onion, and garlic to pan. Cook for 1-2 minutes or just until softened. As it cooks, use a wooden spoon to scrape the browned bits from the chicken off the bottom of the pan. Add ketchup mixture to pan and raise heat again to medium, stirring until sauce comes to a simmer. Turn heat off. Sprinkle in chocolate and stir to incorporate and melt. 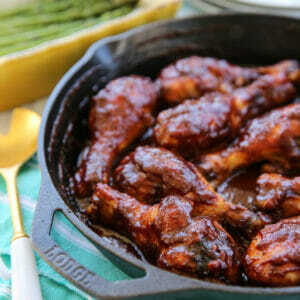 Add chicken drumsticks back to pan, turning to coat each one in sauce and arrange in a single layer. Use potholders to transfer hot pan to oven and bake for 45 minutes. Internal temperature should reach at least 165 degrees. 1. Take a whole onion and simply grate it across a cheese grater until it results in 2 tablespoons (juice and pulp). This fine texture will cook quickly and melt into the sauce so there are not bits of crunchy onion in the smooth sauce. 2. If you don’t have Cast iron, any 12-inch oven proof skillet will work. 3. If you don’t have American Heritage Chocolate, you can substitute dark or bittersweet. 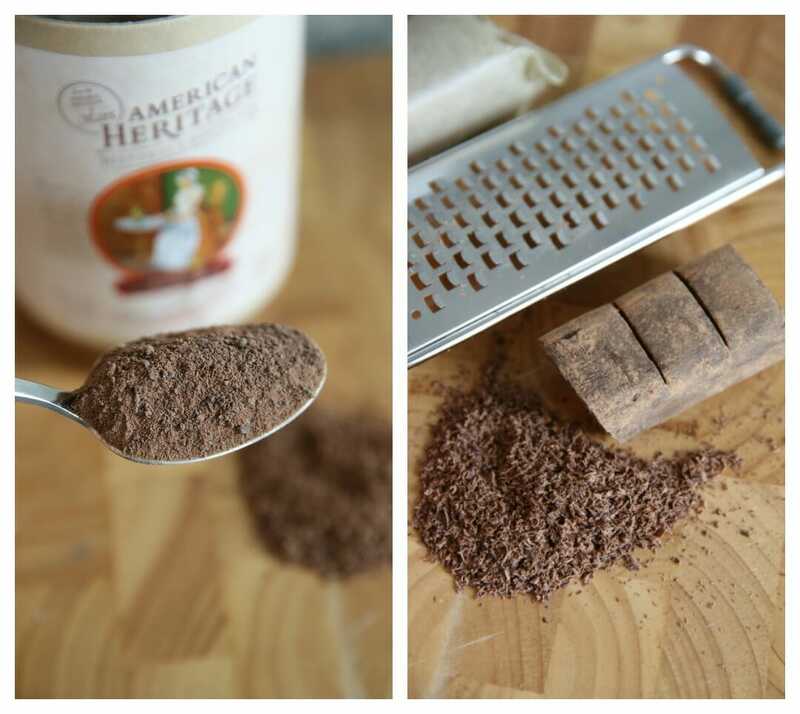 This blog post is in partnership with one of our favorite brands, American Heritage Chocolate®. Opinions and views are 100% our own, as we only promote products we use and love! Your trip sounds wonderful, glad you all had a great time. 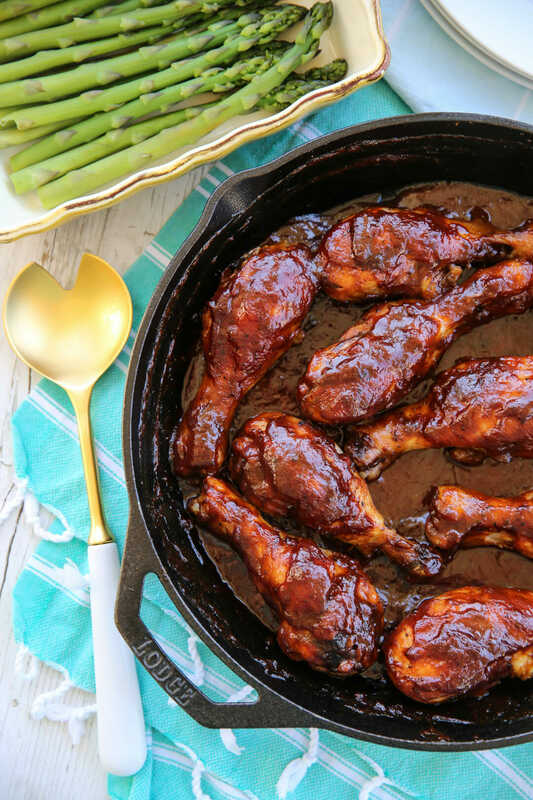 This recipe looks delicious and our grocery store has drumsticks on sale right now. I will try it this week! Thanks! I’ve been a long time follower and for some reason for the past 6 months I cannot pin anything from my iphone. I do EVERYTHING from my phone and I’m so disappointed that I can’t pin because my email is seriously backed up haha! I saw a few other people posting about this issue back in March. Is there something I need to do to resolve it on my end or is it on your end? Thanks so much!! I hate to miss a pin! We have been having issues on and off forever. We’re working on a solution asap! So sorry for the frustration! If you don’t have a cast iron pan, does a regular oven safe pan work ok? Ya, you bet! I’ll add that to the recipe notes. Hey! You missed us in New Jersey—got to have some Jersey Shore–and our historical sites, too. NJ is not all like Newark… We’re not called “The Garden State” for nothing! I’m in Northern NJ–bears, bobcats, oh, my! I am so happy you had a great time on your vacation! This place looks wonderful. What a fun trip. We went to a fort on the Alabama coast last summer and it was just amazing. Also, love the addition of chocolate to BBQ sauce. I bought all of the ingredients to make this and my oven died last night! ? The gas range still works however. So you think I can sear them and then add to crockpot for the rest of the cooking with the sauce? Ya I think that would probably work! That makes sense, the Mexicans use chocolate in their mole sauce, I’ve heard of using cocoa powder and cinnamon in bolognaise sauce. Sounds like a wonderful recipe. I am a long time follower from Australia, you girls are fantastic! OMG! It looks so tasty! I cannot keep my mouth shut! I promise you I will make this soon and let you know! Thanks. We had this for dinner tonight and loved it. The cocoa, added an irreplaceable depth. It reminded me of some of the Latin/Mexican mole recipes I’ve tried over the years. I did make one alteration that you may be interested in, though. The title says “tangy” and as I was cooking and tested the sauce, I didn’t really feel like it tasted like what I would describe tangy, so I added to the sauce 1-2 T (a splash if you will) of Bragg’s Apple Cider Vinegar. We will be making this again for sure and we are going to try in on a pork tenderloin at some point as it gets closer to the winter months. Thanks for the awesome recipes! Keep up the great work you two do! Love the tip! And glad you loved these!